The Bubble Dress (Oliver + S pattern) has always been my go-to dress. 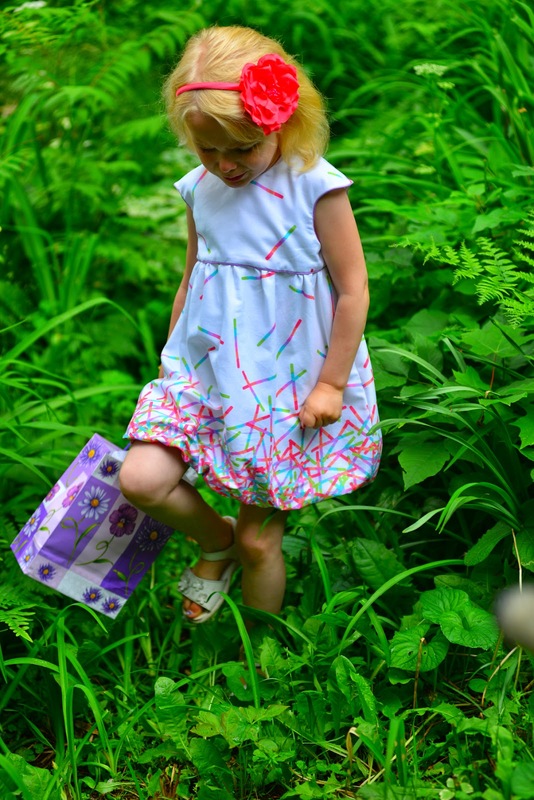 The little capped sleeves on this pattern are just so sweet and the bubble skirt adds the fun. 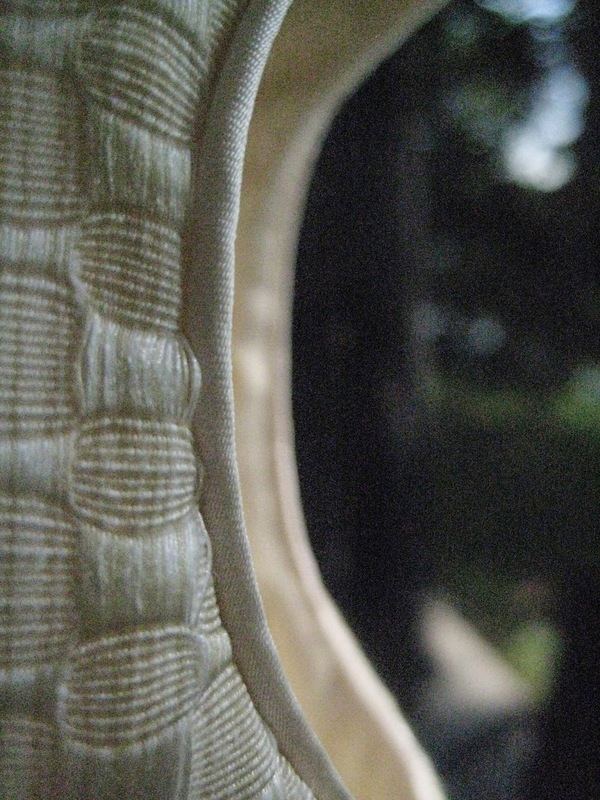 Best of all, it seems to work with just about any type of woven fabric with any size print. I recently found a pretty summer border print and it works perfectly. 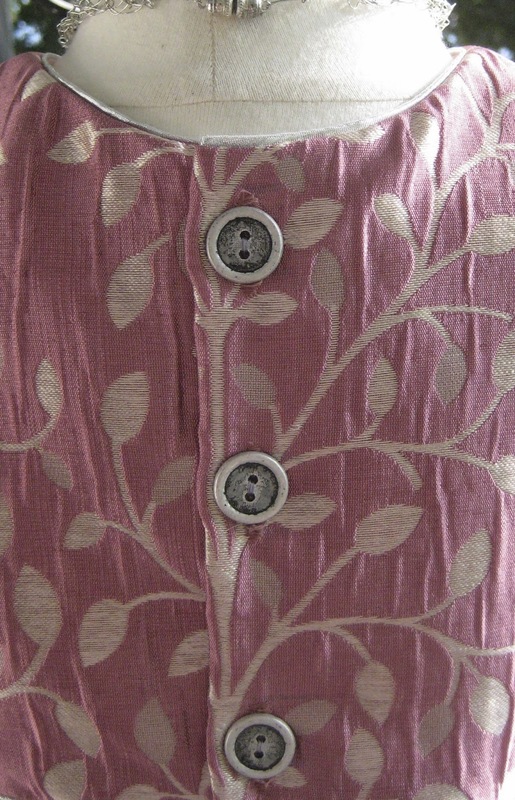 The neck and sleeves are piped in light mauve, one of the colours in the print. 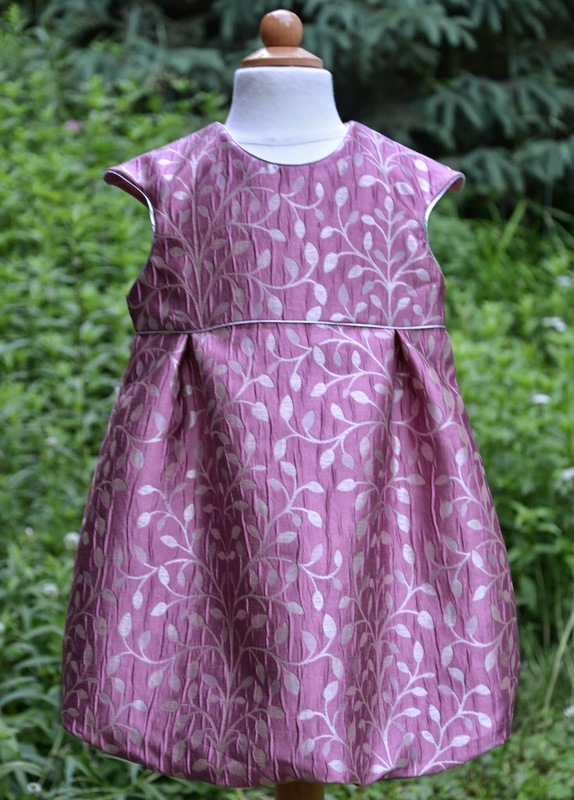 My daughter found a Christmas dress she liked from Gymboree and asked me to make something similar. I found some curtain fabric for about $6.00 in the Home Dec area of a fabric store that looked similar to the fabric of the dress she found to make a knock off. Not knowing I had the fabric, my daughter noticed the store dress was on sale for $16.00 and thinking it was a bargain bought it. Well, I made the knock off anyway, even though it's a duplicate. Our model needs to be wearing some stockings to complete the holiday look but on a hot and humid day so this will just have to do. I glued on some gems following the same design as dress in the store. The glue instructions say it will hold after several washing. Hmmm. We'll see about that! Just in case, I have a little bag full of replacement gems. I piped the dress using leftover satin from a bridesmaids dress I once had to make. The cording or filler for the piping is cotton yarn. I also glued some gems onto a hairband as a girl simply needs accessories! Gathering the skirt using the rather thick and slippery curtain fabric was difficult. First of all, the fabric frayed like crazy, so I serged the edges. Instead of stitching 2 or 3 rows of gathering threads, I zig-zagged over crochet cotton and slid the fabric along to create gathers. But when it came to attaching the bodice to the skirt, the neatly collected gathers would get pushed out from under the pressure foot. The fabric was almost rubber like! In the end, I couldn't get the gathers as even as I would have liked. The dress turned out just fine and …. oh, I can't resist …. it has a nice drape. Back in the Home Dec section of the fabric store was a remnant of a heavy dupioni-like orchid and silver fabric. It was around $6.00 like the last remnant of Home Dec fabric and it was calling me to make it into a Bubble Dress. But this time around, instead of gathering the skirt with unwieldy home dec curtain fabric, I decided to make pleats in the front and back. Between the stiffness of the fabric and the bubble design of the skirt, this dress came out extra poofy. Fun! I used pre-made store bought silver bias binding but couldn't find buttons that weren't too shiny. These ones will do until I get around to making self covered ones. 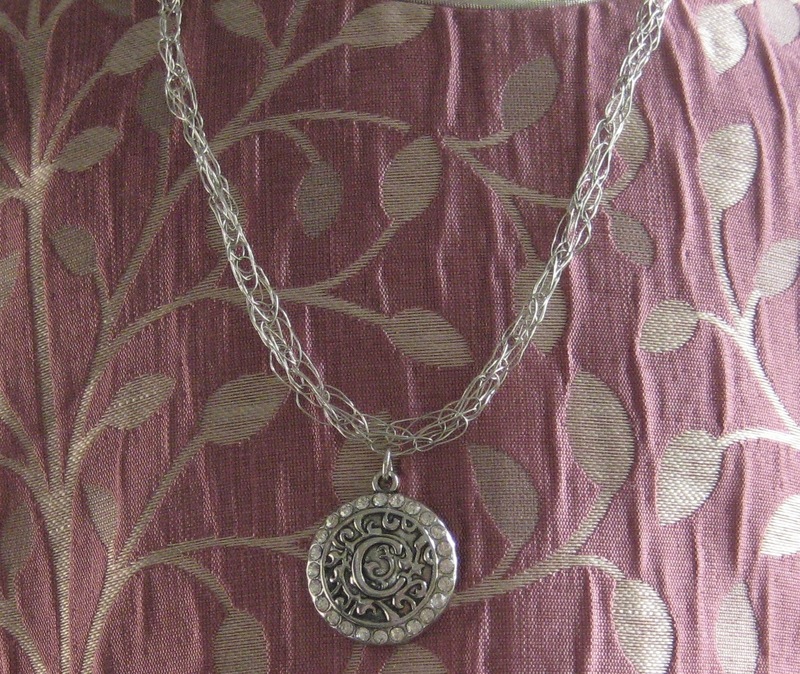 Since I recently learned how to knit, I tried my hand at knitting a necklace with 28 gauge silver wire. The best results came from spool knitting (a.k.a. corking) and added a little initial pendant. Since this dress pattern only goes to size 5, I traced out what I hope is size 6. Looking at the space between the tracing lines for size and 4 and 5, I guessed at what the difference might be between size 5 and 6. I'm sure it's not the correct way to re-draft a pattern but I'm sure it's not too far off. This dress certainly seems to be a size larger than the last two size 5 dresses I just made. All our model needs now is some silvery stockings and a silvery knit shrug which means more knitting. There was a sale recently at a yarn store near here and I bought way too much yarn some sparkly yarn that will work perfectly with this pattern and the orchid Bubble Dress. 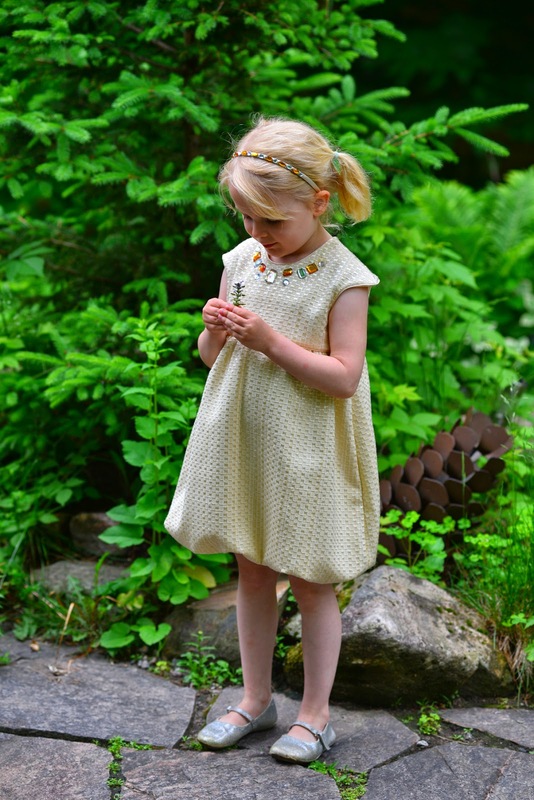 You are very creative in your sewing designing and kniting/crocheting! Oh, wow, I thought the dress above this post was pretty...I don't even know where to begin here...I love, love, love the last one...I like the curtain material one, too...but don't even like imagining the troubles you had with it. And the first dress is adorable. She has to be the best dressed little girl in her entire neighborhood! Interesting that the gems are glued on, what type of glue is used? I, too, wonder long many washings it takes until one of the gems starts to come off. Oh so wonderful- that purple one is just DIVINE! All your lovely Bubble dresses are eye candy! I can't make my mind up which one is my favorite.